Play kitchens are, by far, one of the most popular children’s toys. Little ones of all ages and genders love to make believe that they are cooking, grilling, and even washing dishes! This form of pretend-play often stems from emulating tasks that they see their parents performing and since we always seem to be cooking something up, its no surprise that this is often the first imaginative play our little ones conceive. This page was recently reviewed and updated with a new introduction and more concise, informative FAQs. Where necessary, product information was updated to ensure that all product details are current and accurate. 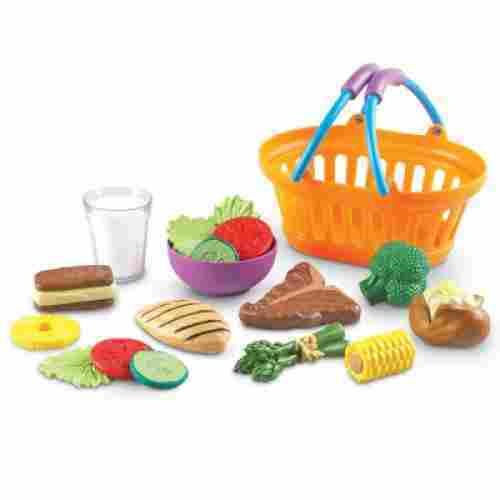 It’s a great play food set that will help teach kids about food groupings. For younger kids, it can help reinforce mastery of colors as well as an introduction to the different foods that are readily available both in the kitchen and in the market. Also helps with the expansion of kids’ vocabulary. Food groups are something that every child learns about in their health class at school, and one thing that can absolutely be reinforced at home. Just because the food they’re playing with is fake, doesn’t mean that what they learn has to be! 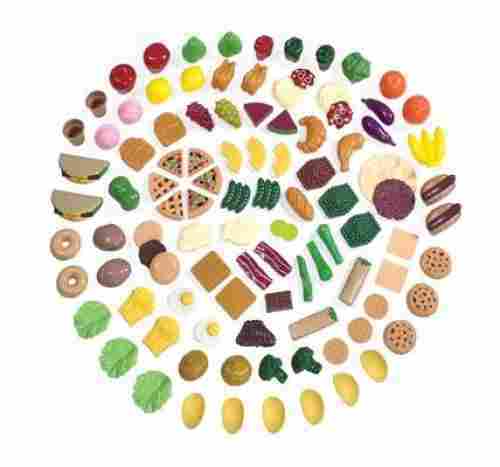 This food set by Melissa & Doug perfectly represents several food groups including grains, produce, dairy, and meats. Each food group is crucial to the development of a human being and your kids will have the chance to understand how important it is to have each one of these through imaginative play. The foods also come in their own separate crates so they’re easy to carry, transport, and put away when not in use. These wooden crates can also come in super handy for kids learning how to create a well-balanced meal, and they can practice mixing and matching various food groups to create something well-rounded and fun. This is a fun way to teach children about all of their main food groups through imaginative play, which is something they’re very familiar with. It makes learning fun while giving them the freedom to play how they want to, with the foods they want. If your toddler loves to go food shopping with you and has a fascination with produce and is constantly wanting to help you, then this toy will give them some solid practice. It’s a cute tool for learning but also helps to encourage imaginative play among toddlers. 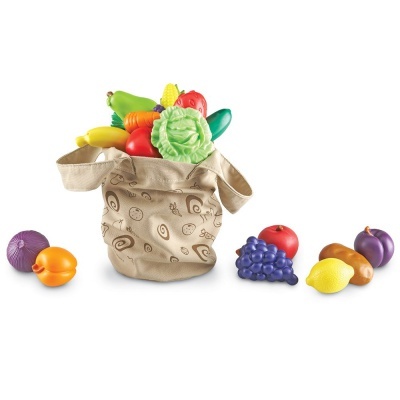 The Fruit and Veggie Tote is perfect for kids just beginning to learn about fresh produce, and it’s a great way to cement the idea of freshness and healthy foods at a young age. It’s one thing to see their parents buying fresh produce, but it’s a whole new experience for them to have their own! 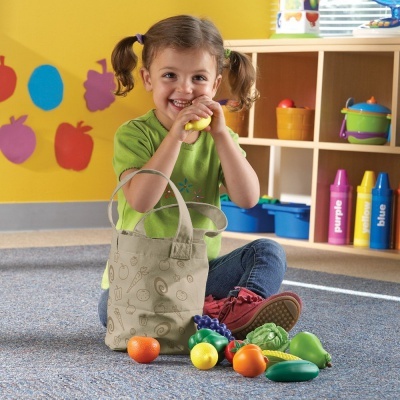 By giving your child fresh produce to play with, they’ll learn about all the things that are healthy for them and be able to carry it around in a cute little shopping bag, not unlike mom and dad. The toy set can make for an interesting imaginative play. The different textures and colors of the different fruits and vegetables can help further develop the color recognition and tactile intelligence of kids. Getting a solid helping of fresh fruits and veggies is really important as a child and even an adult. Helping your toddler to familiarize themselves with each fruit and vegetable that’s good for them can increase their interest and help them to learn what to eat more of as they get older. 3. New Sprouts Munch It! It helps encourage imaginative play and can be instrumental in expanding children’s vocabulary. It’s also a great role play accessory especially for make-believe dinner time play. It’ll teach them about moderation and give them a chance to see almost every food group represented in front of them, and if nothing else, it encourages act imaginative play. This is one instance where it’s totally acceptable and beneficial for them to be playing with their food! 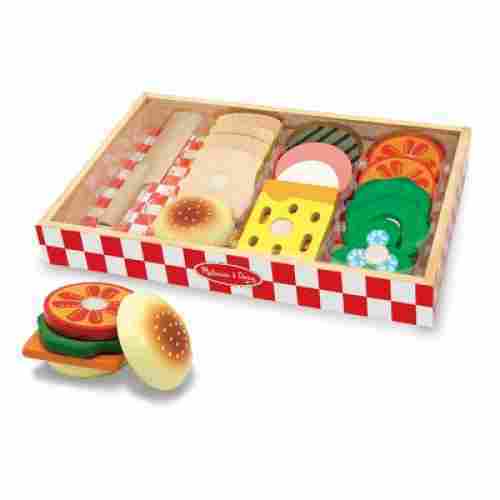 This toy food set is one of the most realistic sets on the market and will keep your kid interested as they play. It’s life-like bowl of cereal and macaroni ‘n cheese are sure to make you do a double take! Make-believe play with this faux food set will encourage kids to expand their vocabulary and mimic daily mealtimes. 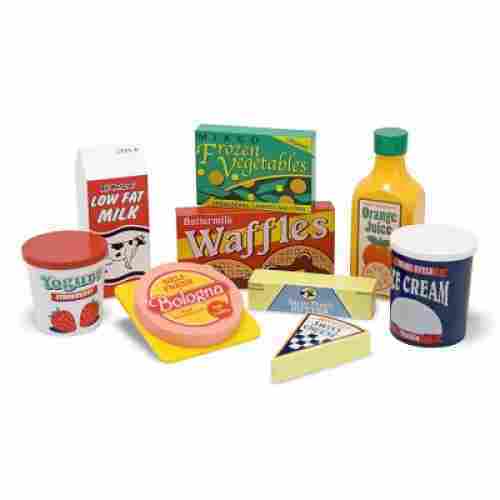 Unlike many faux food sets, this set includes a variety of foods that your kid may already be familiar with. The playset is excellent for stimulating imaginative play while at the same time helping kids appreciate the realism of the play food. This can be a great learning tool for introducing real food to kids. This New Sprouts Dinner Basket by Learning Resources is an amazing way to introduce culinary arts young aspiring chefs. This crush-resistant, highly durable food set has everything that a pretend chef needs to create a gourmet dinner. With it’s vibrant colors and the realistic food in the dinner basket your kid will have a blast serving themselves and others, as this food set comes with a serving bowl. In addition to learning real life skills such as creating meals and serving others, your kid will expand their vocabulary as they learn the names of the different items that are in the food basket. The dinner set is great for travel since it comes with a plastic to fit all the foods back into, and would make an adorable toy to take on a real picnic. While your child is setting up their pretend food, you can bring the real thing! We know that toddlers might be way too young to eat an entire steak dinner, but this is a fun picnic set that will make them feel a little more grown-up. 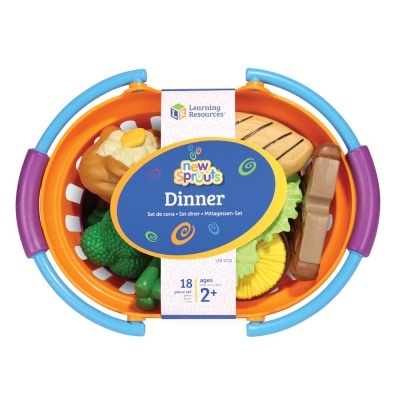 This starter dinner set comes with everything they need to make a pretend dinner, including the main course, sides, a water glass, and even dessert! Kids will have a blast throwing their own dinner parties and serving up their pretend food that they’ve “cooked” themselves. This set would make a great addition to an already existing pretend kitchen, but is perfect just on its own as well. Barbeques are no longer only for Father’s Day and those hot summer months, now your child can have their very own BBQ right in the house. Helps enhance pretend play activities. This can help develop counterfactual reasoning. It’s also beneficial for the enhancement of social skills as the playset requires at least 2 to play. No longer is grillin’ just for the boys, thanks to the gender neutral colors of this barbeque set, girls can enjoy time on the grill, too. This set is complete with everything a kid needs to prepare an awesome, realistic barbeque. With the Backyard Barbeque Grillin’ Goodies by Little Tykes, kids can learn the names of grilling utensils as well as differentiate a hamburger bun and hotdog bun, and condiments such as mustard and ketchup. Kids can pretend play a variety of games, like grilling in the backyard, having a picnic at the park or shopping at the grocery store with this fantastic food toy set. 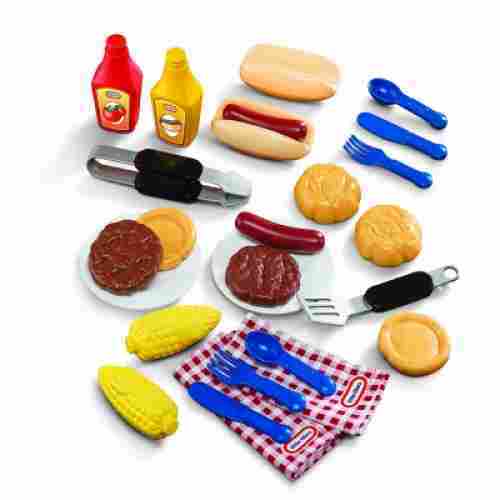 This barbeque lunch set includes enough play pieces for 2 kids to use together. The Grillin’ Goodies pretend food set is perfect for kids who love summer and being outdoors while the family barbeques. If your kids are always looking to help you with the grill but are just way too young to do so, this is a great set to consider to give them a chance to “make” their own BBQ fun. The set features everything they need (except a grill) to put together their own spicy and savory feast and definitely doesn’t skip out on realism or design to do so. 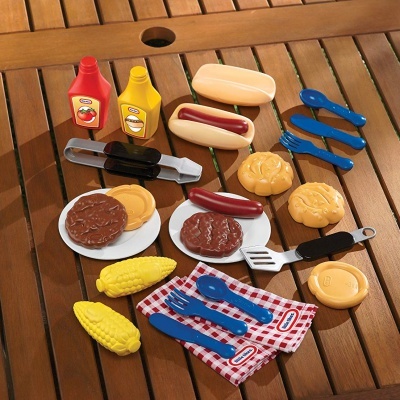 This set even provides kids with the condiments that you always need to have on your picnic table in addition to all the tools they need to flip some burgers or turn a steak. It’s a cute set that has the feel of a real BBQ dinner and will give kids a sense of pride and creativity when they’re playing with it. Which kid doesn’t love helping their parents or caretakers make a sandwich? For some reason, it’s a fascination that all of us -- Something about stacking ingredients on top of ingredients, layering things in just the perfect way, and adding the best condiment of choice for that extra pop of flavor is really exciting. 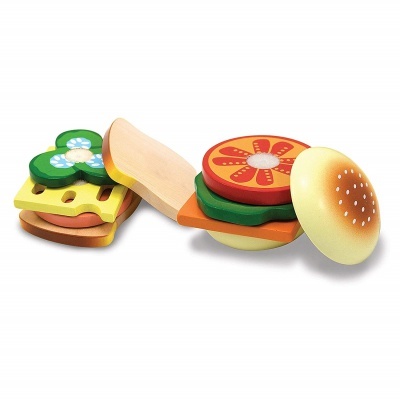 Now that we’re starving, let’s talk about this pretend Sandwich-Making Set. It’s a fun way for kids to do what they see their parents doing every day, but without the mess and the need to actually eat the sandwich...Because let’s face it, not everything kids can find to put on a sandwich is appetizing! This just gives them a unique way to be creative with food, especially for toddlers who aren’t old enough to actually cook or prepare food for themselves yet. The crunching sound as the wooden knife is sliced across the food pieces can help introduce the idea of freshness of ingredients. This helps in expanding kids’ imagination and creativity. The set contains everything a child could dream of to layer on a sandwich or even multiple sandwiches, and it all comes in an adorable little ingredient box. 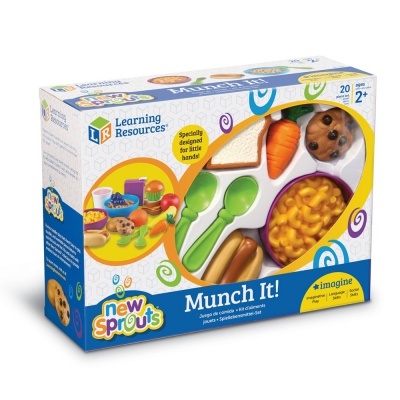 It’s a great starter set for pretend food and will give kids a sense of independence and know-how for when they finally are old enough to start cooking. Taking something that kids are already familiar with and giving them a toy that represents that is a great way to help them learn. 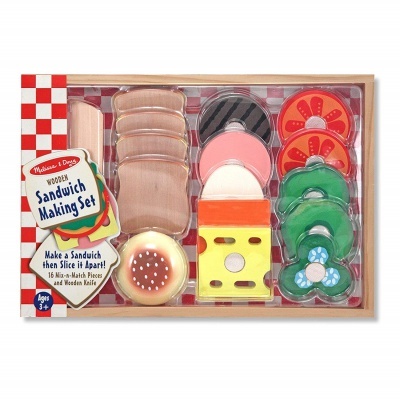 This set may just look like ordinary pretend food, but it’s actually a great way to teach them how to create culinary dishes and learn what does and doesn’t go together --There’s no wrong way to create a sandwich! The toy is great for reinforcing fine motor skills as well as in expanding the vocabulary of kids. It’s also great for make-believe play. You may be wondering why there are a bunch of pretend cans of food on our list of the Best Play Food Sets. We wondered that ourselves until we realized how much a child can get from the label on a piece of pretend canned food. All kids have seen their parents do it while shopping -- You pick up a can of food, read it, and then decide whether or not you want to put it in your cart to bring home. There’s so much importance in that exchange that we often just push it aside when we can really be learning from it! The label on a can could potentially tell you so much about the food that’s inside of it and pretend food is no different. These labels represent real foods that kids would find in the supermarket any day, and it can teach them a valuable lesson about what they want and don’t want in a canned food item. It’s also a great way to teach them how to read and more specifically, how to read in regards to food and their health. Pantries aren’t complete without canned goods. 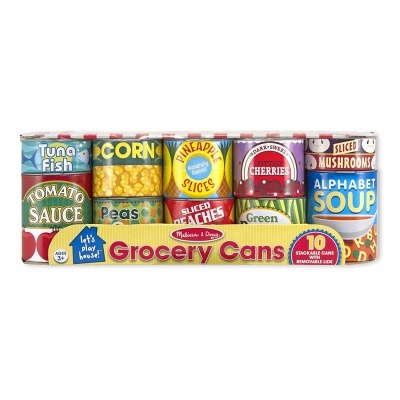 This food set is excellent for teaching your kid about the convenience and essentiality of canned goods in daily life. 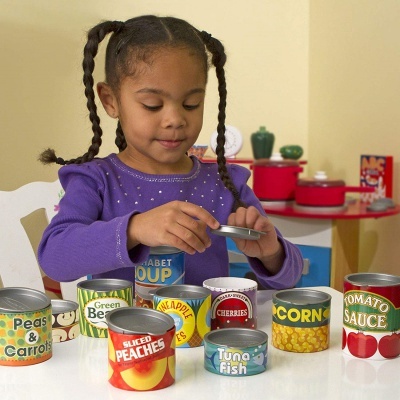 With their brightly printed labels, kids can begin to identify what letter each food begins with and eventually read the names of each canned good. The cans even include realistic nutritional labels on the back so that kids can learn about the basics of nutrition. 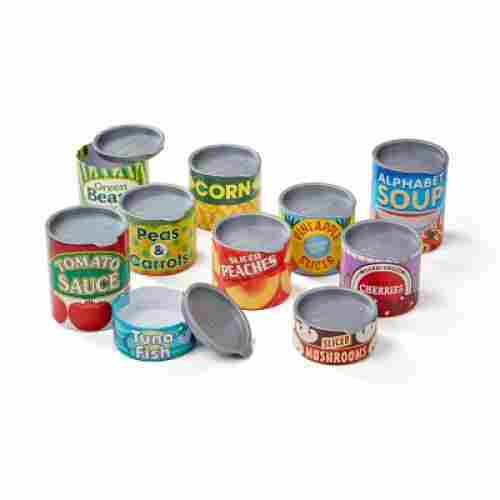 This canned food set promotes independence as the lids are easy to take off and put on without adult assistance. Forget the food groups, why not just get your child the entire pantry? 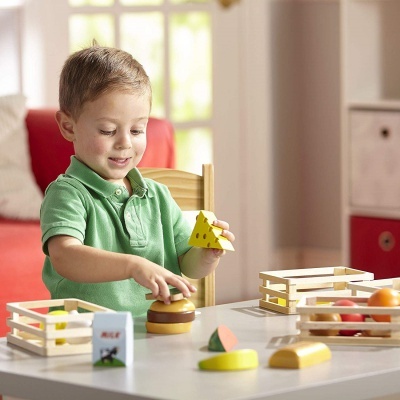 Step2 offers a play food set that comes complete with virtually any food your child could ever dream of playing with. 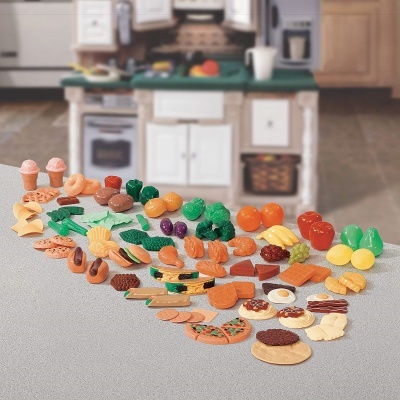 This huge play food assortment set is essential for every kid who already has a play kitchen to have. With a large variety of food choices, your kid will be able to identify many different foods and colors, create and serve meals as well as pretend grocery shop. The plastic is very durable and can hold up well against rough play and not-so-pretend eating, as the food looks so realistic that smaller kids may try to bite into it. For the fact that the food pieces come equipped with drainage holes, they could easily be used during baths or in the pool for extra fun. This set would be perfect in addition to a pretend kitchen but works well enough for imaginative play on its own as well. Each food group is represented here for the most part, and with 101 well-designed pretend food pieces, your child will have no shortage of creative meal ideas. Each piece of food is created to be safe for kids of all ages and with enough detail to be able to tell which real food it’s modeled after. It’s the perfect all-inclusive pretend food set that your little culinary gourmet needs to really set off their cooking career. Your child will be acting like a seasoned chef in no time, even if they can’t really eat this food! Does your child love food and are there just beginning to learn about colors and matching in school? Voila! Thus, we bring you the Farmers Market Color Sorting Set. 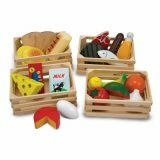 This pretend food set is intended for color-matching since each food represents a color block and comes with five different baskets for matching, but it can be used a counting tool as well or just for imaginative play. Each food that comes in this set represents a certain color and goes with a color group, helping kids differentiate between colors through food while also encouraging them to improve their matching skills. This fun food game can be used as a counting game as well if you have them count each food as they put it in or pull it out of the designated basket. It’s an all-around great learning tool and something kids will actually want to use because of the familiarity of the foods included. Whoever would have thought that a pretend food play set would help kids learn how to match colors and count? This set is the perfect learning tool that encourages learning through foods that kids see every day. It’s a unique way to help young children try their hands at organization and classification. This can become the basis of other more complex cognitive processes in the future. The set is instrumental in teaching kids about which foods should always be placed in the ref to prevent food spoilage. Additionally, it’s a great way to reinforce color and shape recognition. For something a little more familiar and kid-friendly, perhaps a common fridge pretend food set is exactly what your little one needs. 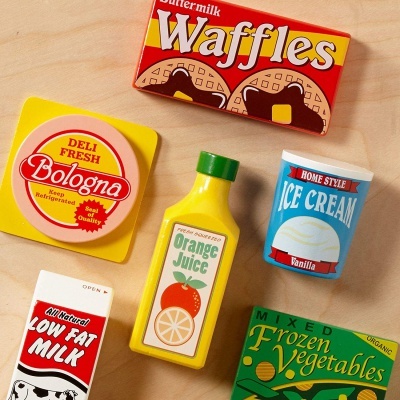 This set comes with all the foods they see on the regular in their own fridges, such as waffles, lunch meat, ice cream, and cheese, just to name a few. It’s great for a pretend kitchen because kids will practice learning what should and shouldn’t go in the refrigerator by practicing on their own, but it’ll also teach them about real foods that need to be kept at a cold temperature. By using foods that most kids love, they’ll be more apt to play with them and come up with new and creative ways to incorporate them into imaginative play. Whether they’re playing alone or with friends, this is a great set for learning about all the cold foods that most of us know and love. It’ll definitely be helpful later on down the line as well -- No one wants soupy ice cream that’s been put in the refrigerator rather than the freezer! Teach kids at a young age so that melted ice cream is never a problem they have to deal with. 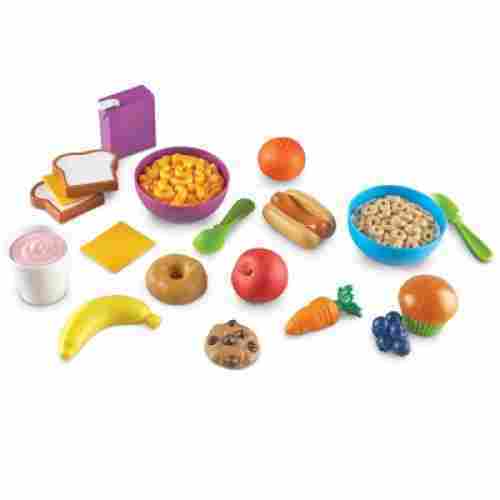 This is one of the most realistic play food sets on the market as it’s geared towards everyday, common foods that kids see in their refrigerators. It’s safe and durably made for hours of pretend-play as each item is made out of wood that has been hand painted. For this reason, none of the food included in this set has an expiration date, ensuring years of fun to come. Young kidss learn best through play. The list that we provided above will help kids develop lifelong skills in a variety of ways. 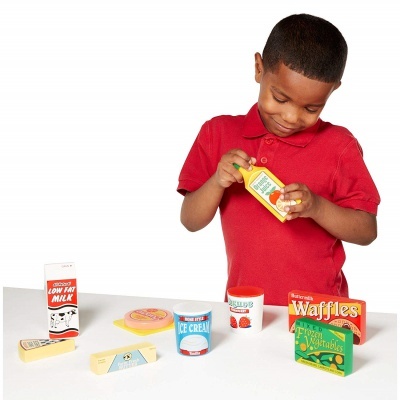 While playing with these toy food sets, kids learn the names of common food items and the food groups they belong in. Kids learn about the importance of properly preparing food and serving it to others. The cutting utensils will help kids to develop fine-motor skills and pay attention to detail as they safely and properly slice various fruits and vegetables. In addition to that, kids will learn about the names of colors, counting and sorting as well as organizing and storing food. It’s tough to find play food sets that aren’t made of flimsy, thin plastic. But through our research, we did just that as we compiled our list of the 10 best play food sets for kids. It’s important for kids to have toys that are made to last. Our list includes timeless wooden toys that are designed to stand up against frequent use. The plastic toys on our list are crush-resistant as they are made with hard, durable plastic to ensure years of imaginative, physical and social play to come. Understanding the predicament of every parent has been our primary motivation for performing a very exhaustive search into the best play food sets available today. It is very important that we take into consideration the safety of the materials used in the manufacture of such toys. They must be free from lead, phthalate, BPA, and other harmful chemicals. Additionally, the design must be appropriate to the developmental age of children. For example, older kids will require more realistic play food items while younger children will need safer and more rounded play foods because of safety considerations. We also had to consider what other parents and consumers have to say about these play food sets. We want to provide you with a list of toys that has been fully accepted and duly recommended by fellow parents. Lastly, we also had to look at the trustworthiness of the toy maker. This is crucial because a company with a good manufacturing practices certification will clearly be a lot better choice than one that doesn’t have any certification at all. Recipients of specific toy design awards are also counted. One of the most challenging aspects of child-rearing is getting young childrenn to have an appreciation for a wide variety of foods especially fruits and vegetables. This is where play food sets can help parents by providing kids with the right tools to simulate the planning of meals, the preparation of food, the cooking of dishes, and the organization and setting up of the table. While it is understandable that younger kids will still not be able to really appreciate the concept of good nutrition, older kids will learn about adhering to the different food groups. When played together with other children, it can help foster healthier eating habits by conforming to the rules set by the peer group. For younger children, the bright colors of the play food sets can help enhance mastery of the different hues. They will also be able to reinforce their mastery of different colors and shapes through the play food items that they are provided. 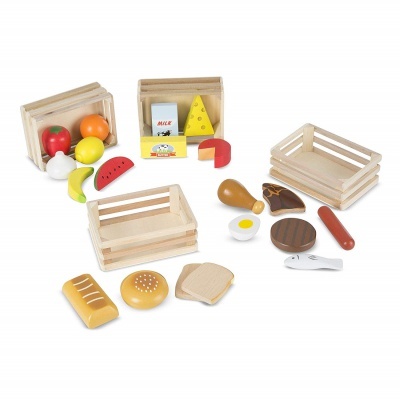 In some types of toys where the food items form part of a puzzle, these help develop early problem-solving skills particularly the convergent type. However, as older kids can play with the play food sets in an open-ended manner, their divergent problem-solving skills, as well as counterfactual reasoning skills, can be developed an/or enhanced. This type of problem-solving skill makes use of more complex cognitive processes that are essential building blocks to more complicated experimentation, scientific problem-solving, and logic and critical thinking. Playing in an open-ended manner helps facilitate the formation of what-if phenomenon which can help enhance children’s ability for prediction. On the physical side of child development, picking up the different types of play foods require control of smaller groups of muscles. It also helps develop hand-eye coordination, dexterity, and spatial intelligence. For older kids, playing with these foods on a make-believe kitchen can help strengthen leg and arm muscles as kids will have to make use of larger groups of muscles to move about and cook and prepare their make-believe dishes. Regardless of age, the mere fact that play food sets help children act out their fantasies can help in their emotional development. This can become the basis for the development of a healthier self-concept, boosting their self-confidence, and help establish more trusting relationships with their parents, their siblings, their friends, and other people in their lives. Play food sets are clearly one of the best gifts you can ever give a child. With our list of the 10 best play food sets for kids, we are confident that your kid will be excited to cook up something new! When searching for the top-rated products, we also factored in the health and safety of the materials being used. The majority of the products on the list are BPA-free, as noted by the company on their website or on Amazon. All toys are easy to wipe down and wash so bacteria can’t collect in those nasty crevices and cause infections and illness. Products are all made of soft plastic, felt, or wood, and we’ve avoided sets that have too many sharp edges, which might snag soft little fingers and skin. Give kids the chance to dice and chop with the best of us. Multiple sets have plastic or wooden knives with produce that splits in half so children can safely practice cutting skills without mom and/or dad worrying about them hurting themselves. Velcro inserts allow these pieces to pull apart and stick back together so kids can do it again and again. We know they want to feel like big boys and girls, and we know YOU want them to learn carefully and in their own time. We’ve aimed to collect toys that are easy for children to handle, even when very young and still building their motor skills, while also being free of harmful chemicals and potential choking hazards. Always remember to supervise toddlers when they’re working with especially small pieces. If they’re really sneaky chewers, remove the smaller pieces from the set before giving it to them, and save those toys for a later date, when they’re a little more age appropriate. Play food also provides opportunities for your child to understand the nuances and social expectations that come with food preparation and eating. Hosting a tea party with their stuffed animals may seem like a fun time but these play sessions can actually teach your little one how to politely ask for condiments, introduce socializing concepts, and even help encourage utensil use. They can learn food preparation skills, cutting techniques, and build motor skill control all within the safety of their playroom. One of the best things about our list of play food sets is that they are all unisex, or gender neutral. All kids can enjoy playing with these sets whether they are a boy or a girl. There used to be a stigma that cooking in the kitchen was reserved only for girls and that grilling was only for boys. However, that’s not what real life today entails. Through these gender-neutral toys, both, girls and boys can do and enjoy the same things. This is great for parents who have kids of different genders to teach them how to share and play together. q: Are these toys BPA-free? Through our research, we discovered that yes, the majority of the items in the food sets are BPA-free. BPA or Bisphenol A is a harsh chemical that is used in epoxy resins and polycarbonate plastics. BPA can have a negative effect on our health. With BPA-free toys, you can rest in knowing that your kid isn’t playing with toys made of toxic, harsh chemicals such as lead and phthalate. It’s always important to check with the toy manufacturer to find out what type of materials the toys are made of. q: Are these toys washable? Yes, all of these toys are easily washable. For the plastic toys, to wash them, we recommend that you take the following steps:Start by spraying them down with your favorite eco-friendly cleaner and wiping them off with a hand towel to remove all dirt and debris.Fill your sink or a bucket up with a warm soapy solution to allow the toys to soak for a few minutes.Afterward, scrub them gently to sanitize them well.Lastly, rinse and air dry. q: How should I clean and sanitize the wooden toys? For wooden toys, you should not let them soak for the fact that it may cause water damage. To remove dirt and debris from the toys, lightly spray them with your favorite eco-friendly cleaner, and gently wipe them down. To properly sanitize them:Allow a washcloth to soak in a warm soapy solution.Ring the washcloth out and gently scrub the wooden toy.Use a separate washcloth to rinse any remaining soap off and allow to dry. q: Are the toys appropriate to use in a childcare center? Yes, the food sets listed above are appropriate to use in a childcare center. They are safe, durable and very educational. Kids in childcare centers will enjoy these fun toys and can use them as supplements to go along with lessons such as math, reading, and culinary arts. They can also just use these toys to have lots of fun, as they promote imaginative, physical and social play. The food sets on our list will also encourage kids to share with others. q: Are the cutting toys magnetic? No, the cutting toys are not magnetic. However, they are easy to stick together and take apart as Velcro is glued onto the pieces. q: Are these toys safe for outdoor use? Yes, these toys are safe to play with outdoors. The food sets on our 10 best play food sets for kids list are all crush-resistant and durably made. However, we don’t recommend leaving the toys outdoors for a long period of time as the vibrant colors may become faded from the heat of the sun. In addition to that, the wooden toys may become ruined if left out in the rain for an extended amount of time. q: What if my child chews on these food-shaped toys? There is always a risk of a child chewing on their toys, whether they are food-shaped or not! Most of the products on this list are recommended for children who are at least 3 years old and well past the teething stage to prevent chewing as much as possible. They are also BPA- and toxin-free so even if your little one does take a nibble there is no concern that it will be detrimental to their health. q: Are toy knives appropriate for young children? Whether you allow your child to play with the utensils included with some of these food sets is entirely up to you. Research suggests that introducing toddlers to utensil and knife use from a young age can actually deter them from incorrect use down the road. Of course, this is best done in a controlled setting, such as with the plastic toys included with these food play sets. Teaching your child proper knife etiquette through the use of pretend play can help discourage them from kitchen accidents in the future.